I was once upbraided by a publisher (whose book I can’t have liked particularly much) for “caring about style”, a comment I’ve never really forgotten when it comes to the art of fiction. You go to a solicitor because they relieve you of the need to plough through legalese, you call a plumber to fix your leaking tap - is it such a strange leap to expect a novelist (to whom you grant your precious leisure time) to have a particularly good way with words?! Isn’t the style to a greater or lesser extent always one of the thrills of a superior work of fiction? I thought of this when reading Patrick Holland’s beautiful, beautiful second novel. 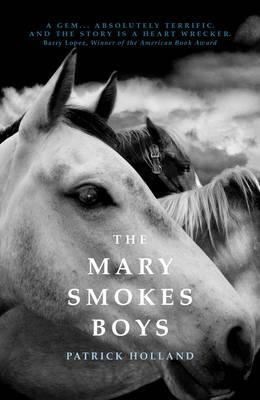 The Mary Smokes Boys is a tale that transports you through its realisation of place (“back of Brizzie” I guess they call it, for us Southerners that would be the South-East Queensland hinterland, not far from the fabled Glasshouse Mountains), and its genuinely affecting story of love (for brothers,sisters, mothers, fathers…). And yes, for a language as pure and magical as I have read in a long time. Take chapter openings such as this: “They waited for the next new moon. At eleven a shredded blanket of cloud separated earth from stars. Wind thumped across the plain from the dry west”. Or this: “ The morning was crisp and clean and the country was tinged the colour of lemons”. We know and can picture this scene exactly - but it takes a Holland to describe it with such felicity, such poetry! The landscape though - for those open to acquire the knowledge - can and does confer identity and belonging, as it has for thousands of years to the aboriginal community in the region. One of the North’s neighbours in fact, Eccleston, is a boy of mixed blood - and it is his connection to the land which means that Grey soon joins in his rough'n'ready group that calls themselves the “Mary Smokes Boys”. Their adventures - normal adolescent larking-about as well as those of a darker, riskier hue, form the backbone of this novel. There are echoes of Jon Bauer here in Holland’s ability to inhabit these wonderfully realised young characters, and I also thought of Chris Womersley’s The Low Road in that a sense of foreboding is never far away (as well as an unobtrusive but trenchant cultural critique going on in both books). Finally, a larger theme Holland addresses is an existential one: namely what is the status of faith and hope in the vanishing world of country Australia (as our metropolises expand ever outwards, and small towns stay only barely viable)? The novel explores the attraction of the bush (symbolized in the novel as"the west"), where it is still so easy for the young “to play truant from the world”; but also the allure of the city (“the east”), also symbolized in the novel by Grey’s city girlfriend Vanessa), where meaning and purpose possibly reside. There are no easy resolutions on that score, of course, and the novel’s trajectory is as unsettling on this front as the issues it addresses appear intractable. A major work then from a writer I had not known of before, but cannot help but think has a substantial career ahead of him!